Find out what Earth Notes is all about. What is its history, background and motivation? What Is "Earth Notes" / Earth.Org.UK / EOU? Why Can You Trust Earth Notes? What Is EOU's Intended Audience? Who Uses Earth Notes And Its Ideas? Earth Notes Turned 10 in 2017! What is Earth Notes about? Who creates the content? This site is about practical steps that I have taken to make my own life (and that of my family) a little better and lower-carbon. Cutting carbon at home to slow climate change, using high and low tech. Living a normal life — no hair shirt required! Earth.org.uk aka EOU aka "Earth Notes" celebrated its 10th birthday in 2017. Early in 2007 I had a small brainwave and decided to create a simple single-page microsite about composting vs domestic solar power. It was an issue that was exercising me at the time, and the remnants are now in their own page. All "Earth Notes" content is written by Damon Hart-Davis. Upper-case initials at the very end of the image name before the extension, eg some-image-DHD.jpg would be an image by 'DHD', ie Damon in this case. A text file alongside the image file at URL X as X.txt. An 'information' link 'i' may be automatically inserted in the page in some cases. Description of the origin or thanks in the body text and/or image alt text. Who is Damon? And why does he care about energy? See Damon's home page for a bit more on him, education, CV, etc. Here's how Damon got into optimising energy after being a UK Internet pioneer. Then working in defence, oil and banking. A few years ago I suddenly saw my energy bills as another performance metric that I could tweak just like optimising Lehman Brothers' derivatives calculations that I was nominally paid squillions to do. Earth Notes aims to be clear, honest, accurate and transparent. At the end of most articles you will find a section with sources and links relevant to the article. Earth Notes is all about reducing climate change. Even unpalatable ideas may need to be considered, to that end. Views may change over time as evidence accumulates. Articles will be updated as appropriate to reflect those changes. Earth Notes will continue to report these "inconvientent truths", annoying nuances and real uncertainties as necessary. Many data sets are published on the site. These are often data gathered by Damon Hart-Davis. Sometimes the data may be from third parties. Earth Notes uses metadata such as schema.org to help maximise machine-readability of material on the site, including data sets. Metadata also enhances use with social media and search engines. The site is primarily intended for UK (and nearby) readers. Readers will have an interest in energy efficiency and reducing their carbon footprint, especially at home. Allegedly, Earth Notes has been cited in research papers and has influenced projects by significant climate change actors! Earth Notes has been quoted in the press, its technology used in third-party sites. Its automated and other posts are followed on social media. 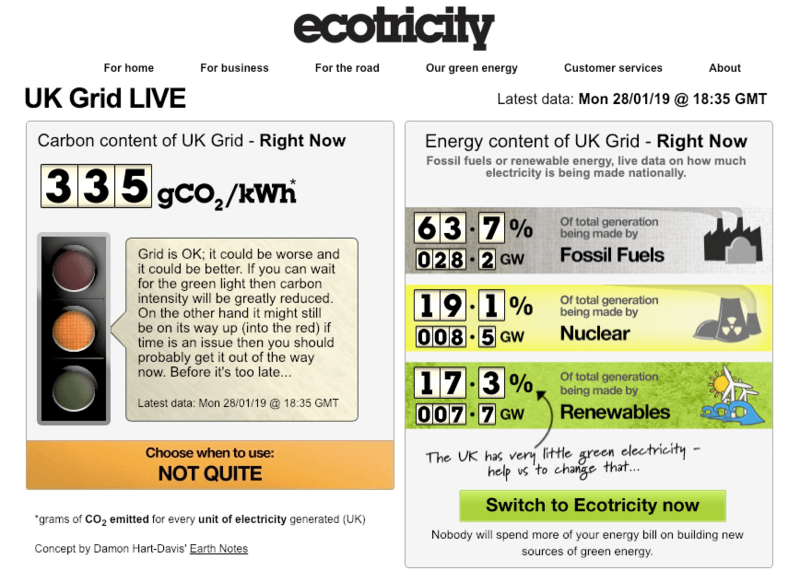 The Ecotricity version of EOU's GB grid carbon-intensity tool. The Guardian: It's a myth that wind turbines don't reduce carbon emissions: "The researcher Damon Hart-Davis, who maintains a real-time website showing the grid's carbon intensity called Earth Notes, confirms separately that when the wind is blowing the UK emits less CO2 per unit of electricity generated." First published 2018-09-28 , updated 2019-04-22 . Site copyright © 2007-2019 Damon Hart-Davis. Hosted by ExNet.